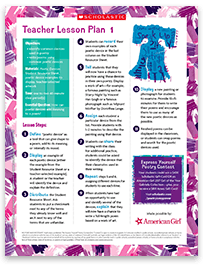 for classrooms from Scholastic and American Girl®. 3 Grand Prize Winners: When classrooms share their poems, students and teachers could win big! 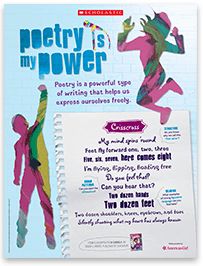 Inspired by Gabriela McBride, American Girl’s 2017 Girl of the Year™, Poetry Is My Power offers lessons and worksheets that support higher learning standards and engage students in an examination of the fundamental elements of poems. 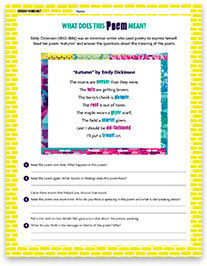 Students can discover more about poetry by reading Gabriela by Teresa E. Harris. Learn more at scholastic.com/american-girl. Void where prohibited. The Express Yourself Poetry Contest (the “Contest”) is open to students in grades 3–5 who are enrolled in public schools, accredited private schools, or home schools in compliance with the laws of the students’ primary state of residence (“Schools”) and who are legal residents of the 50 United States or the District of Columbia (hereinafter referred to as “Student” or “Students”). 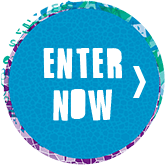 Entries must be submitted on behalf of the students by teachers of any grade from 3 to 5, who currently teach in public schools, accredited private schools, or home schools in compliance with the laws of their primary state of residence, or parents or legal guardians. Start: 12:01 a.m. ET on 3/1/17; deadline: 11:59 p.m. ET on 4/30/17. Read Official Rules.